Stage 11: from Modena to Asolo, 227 km. FOLLOW THE LIVE! 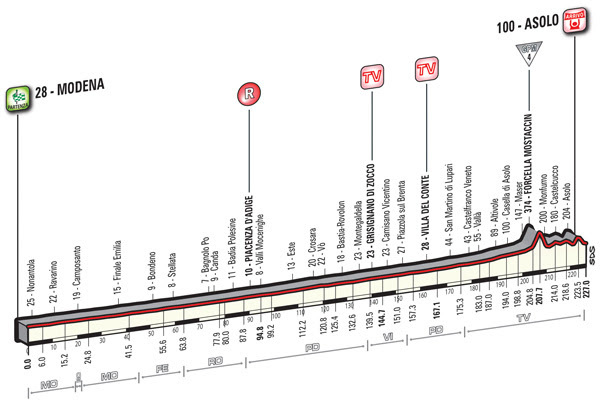 Stage 11 of the Giro d’Italia, 227km from Modena to Asolo. The stage, mostly flat, has a hilly finale to suit the finisseurs. The group, 183 riders strong, passed km 0 at 11.50. Modena: light cloud, 20°C. Wind: weak – 4kmh. Asolo (approx. 17.10 – Finish): Scattered clouds, 19°C. Wind: moderate – 12kmh. During the stage, time bonuses of 13 seconds are up for grabs. A maximum possible 90 points are available for the points classification, not to mention 3 King of the Mountains points. The stage is clearly divided into two parts: the first one runs flat from Modena to just before Asolo (approx 200km), while the second one is wavier and more challenging, leading into the finish. The route runs across the entire Po Plain, partly on narrow roads, and partly on wide and mainly straight roads – but riders must beware of roundabouts, kerbs, speed bumps and traffic dividers through urban areas. 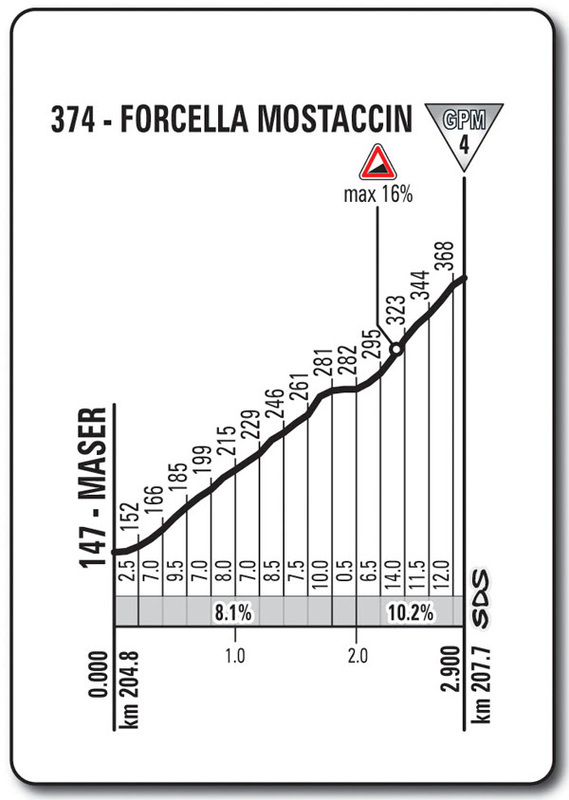 Just past Maser, the road tackles a short yet very harsh climb up Forcella Mostaccin (with gradients topping out at 16%), followed by a technical descent (narrowing in places) leading to the Monfumo hills and to Castelcucco. Here, a series of undulations will lead to the final Asolo climb. Five kilometres before the finish, the road climbs up towards Asolo along a 1km ramp with gradients of approx 7% that leads into the old town centre through a mediaeval gateway and on a setts-paved stretch. A quick descent on wide roads follows, up to the final kilometre. The last bend is 900m from the finish line, followed by a long home straight, just bending slightly, on a perfectly level, 7.5-m wide asphalt road.